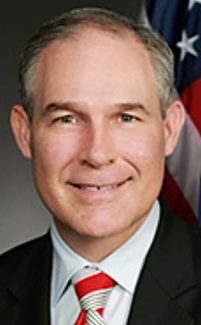 The Senate Environment and Public Works Committee confirmation hearing on Scott Pruitt, the Oklahoma attorney general who is President-elect Donald Trump's nominee for administrator of the Environmental Protection Agency, was dominated by questions about whether he would recuse himself and his views on climate change, but senators also raised issues about biofuels. Pruitt promised to reduce the scale of EPA's regulation compared with the Obama administration and to follow the EPA ethics on questions of recusing himself from decisions on lawsuits against EPA in which he has been involved. He also said his personal views on the cause of climate change is "immaterial," according to coverage of the hearings by major newspapers. But under questioning from Sen. Joni Ernest, R-Neb., Pruitt also said, "To honor the intent and the expression of the Renewable Fuel Standards statute is very, very important. It's not the job of the administrator or the EPA to do anything other than administer the program according to the intent of Congress. And I commit to you to do so." He also said "The market has changed since 2005. The waiver authority that has been provided by this body is important, but that waiver authority should be used judiciously, and the act should be complied with and enforced consistent with the will of Congress." Pruitt also said he would enforce EPA's Chesapeake Bay cleanup plan, even though he tried to block it, EPA reported. Farm groups, developers and state attorneys general tried to stop the plan in the courts, but the Supreme Court left it in place. Farm leaders have said they are afraid the Chesapeake Bay plan involving several states could be used by EPA as a model for cleanup in other regions of the country. Roger Johnson, president of the National Farmers Union, a Democratic-leaning group, said he was reassured by Pruitt's remarks on the RFS. "Mr. Pruitt's remarks today, coupled with President-elect Trump's campaign promises to support the RFS, indicate a clear commitment to ensuring the RFS will not be undermined by the incoming administration," Johnson said in a news release. "Today's statements lessen rural communities' concerns over the incoming administration's more ambiguous previous discussions over the RFS. NFU looks forward to working with Mr. Pruitt and the EPA in support of proper implementation of the RFS in addition to other farming and ranching related environmental issues," Johnson concluded.